SMART>SOS is one of the 10 winning projects of the new VERTIGO STARTS initiative supported by the European Commission's Horizon 2020 program. Tim Otto Roth is developing together with Bio4Comp researchers from Dresden, Chemnitz (both Germany), Lund and Kalmar (both Sweden) a sound and video installation revealing the new paradigm of bio computation: a sub-sub-microbiological machinery based on tube like protein polymers, the so called microtubules. Press CC for English captions of the German interview. You find an extended 12 minute version on vimeo. SMART>SOS premiered as 30 channel loudspeaker installation in June 2018 in occasion of the VERTIGO STARTS day at the IRCAM/Centre Pompidou. Turning Science Into Art Into Science - Digital Single Market blog post about SMART>SOS by Till Korten published on 11 September 2018. SMART>SOS is a collaboration by Tim Otto Roth and . 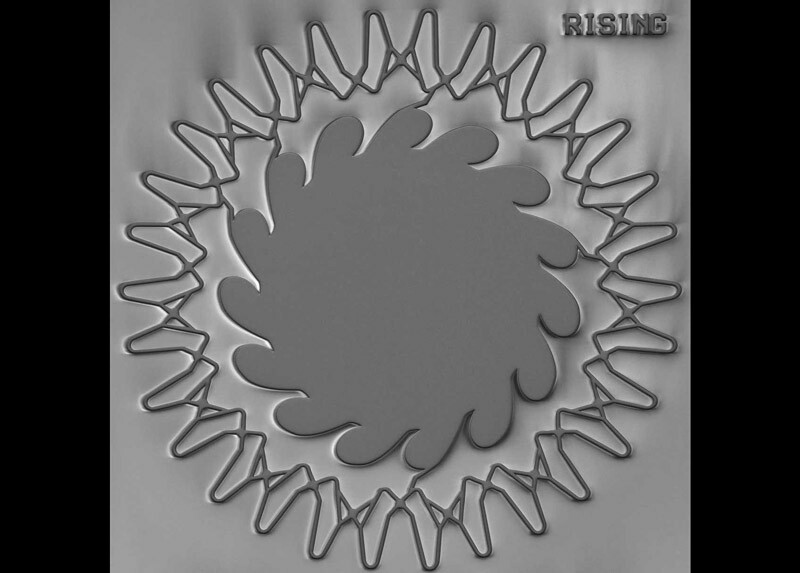 The residency is funded by the EU Horizon 2020 program VERTIGO STARTS. Bio4Comp developed a sophisticated mechanism to create a bio computer: It uses tube like molecules moving in a special labyrinth like nano structure edged in silicon dioxide. Essentially this network structure is designed to solve a so called subset problem. Bio4Comp's solution of this NP complete mathematical problem can be compared to a kind of marble run with agents passing a pyramid like structure of joints. Although the marble balls turn randomly left or right at the split joints, the distribution of the balls at the outputs represent a certain pattern due to the geometry of the network of split and cross joints. 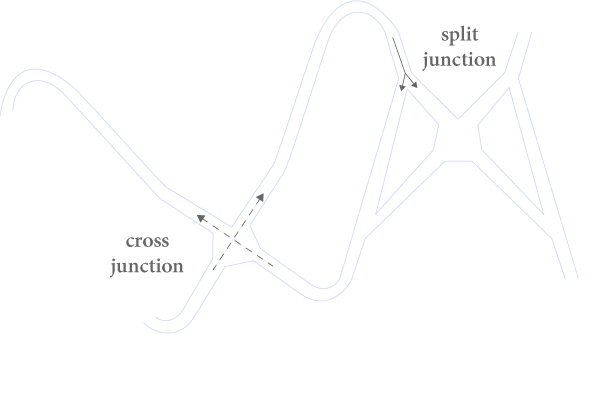 A combination of split and cross joints creates the basic units for the ring like feedback structure. The outer channel structure is supplemented with an inner reservoir structure. The topology of the connections inbetween influences the distribution of agents. Computer simulation testing the activity of the agents in the structure. Image: Till Korten. The developed resin structure viewed in the optical microscope. Scanning electron microsope picture shwowing the unedged structure on the silicon waver. Image: Georg Heldt. A kind of interaction between the bio-molecular agents is created by adding a kind of dead end in a cross junction. 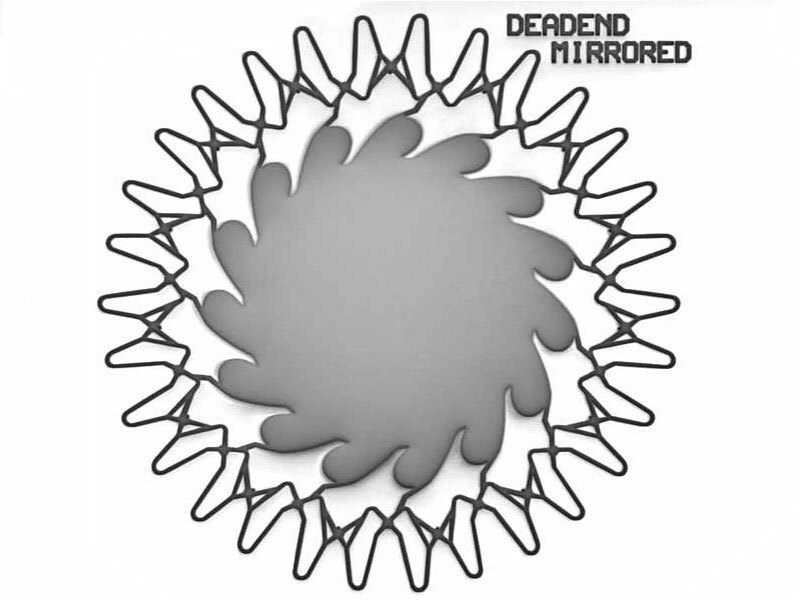 Detail of the deadend loops at maximum resolution in the optical microsope. Scanning electron microscope picture of the dead end edged in silicon dioxide. Image: Georg Heldt. The artist designed togehter with Till Korten also alternative structures whith diffrent supply structures. 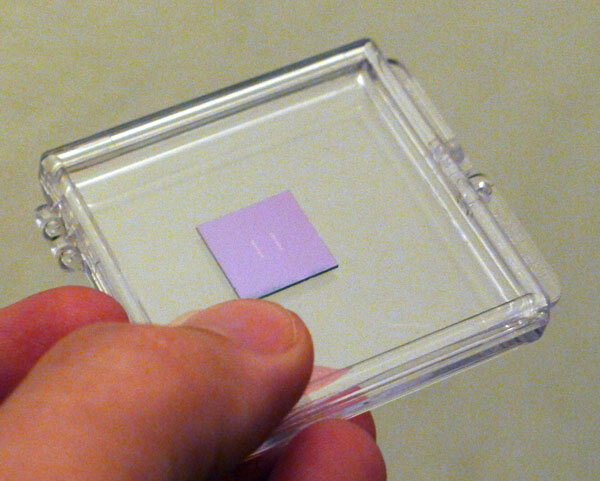 The chip with the nano structures in silicon built at Fraunhofer ENAS in Chemnitz. The essential component of the circular logic is to link the units by a kind of feedback: Every unit gets an input from the left or the right neighbour and passes the agents at split joints either to the right or left neighbours. The supply structure for the agents in the centre plays also a special role. 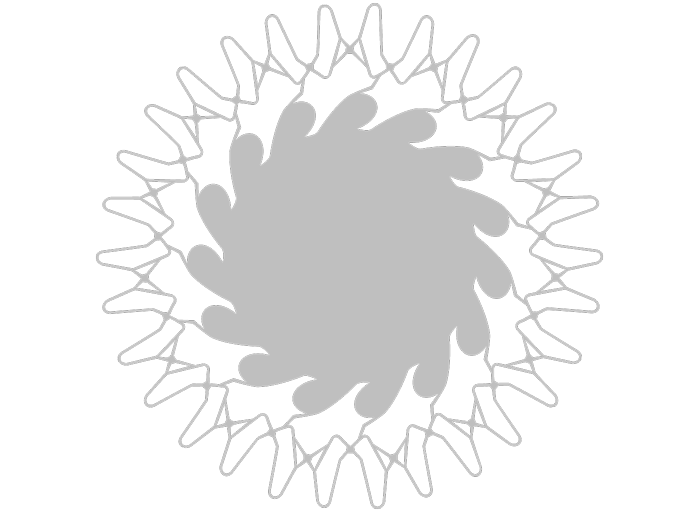 The shape looking like a circular saw blade triggers a circular motion of the agents and feeds them accidentally into the outer ring structure. The number and the position of the connections between the reservoir and the network results in different concentrations of the agents. Last but not least, a kind of interaction between the bio-molecular agents is added designing a kind of dead end at the unit combining a cross and split joints. 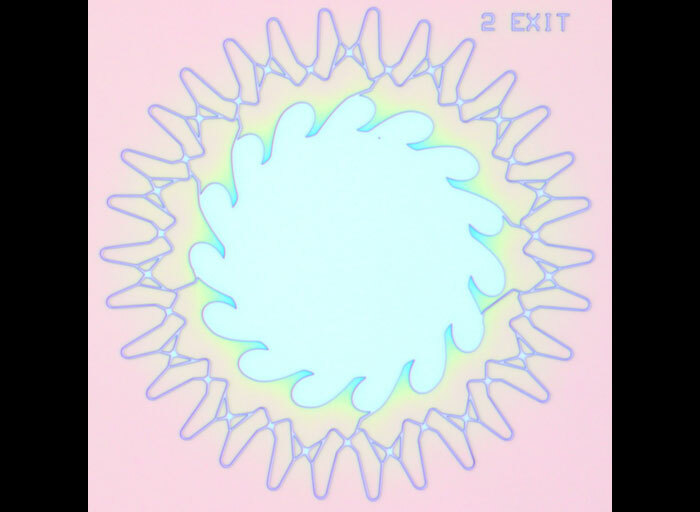 This dead end causes some of the microtubules coming from one direction do get stuck. Consequently, they obstruct the passage for the microtubules coming from the other direction causing some of them even to go into solution. By that way a kind of rudimentary conditional logic gate is created. 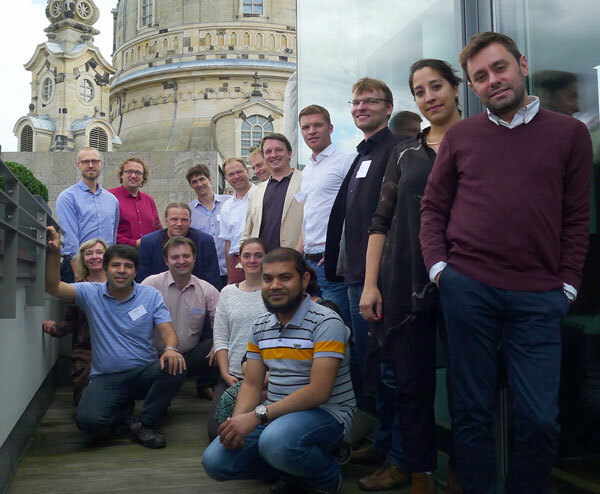 The kick-off for SMART>SOS was the Bio4Comp workshop in mid-September 2017 in Dresden, presenting the project to the entire consortium. A quite sustained discussion of the conceptual parts of the project was followed by an extended meeting with Dan Nicolau Jr. (Molecular Sense Ltd, Oxford, UK) and Hillel Kugler (Bar-Ilan University, Israel). 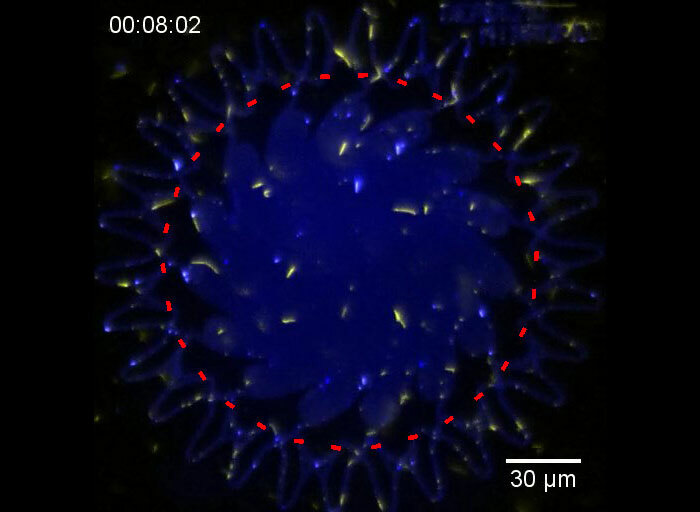 The particular work started thereafter in the Diez Lab at TU Dresden together with Till Korten: Till and Tim tested the ring-like network topology with 15 interconnected units in extended Matlab simulations, which helped to optimize the fluidic structure and to test new supplements. 30 "detector" zones were added to measure the transit of agents. 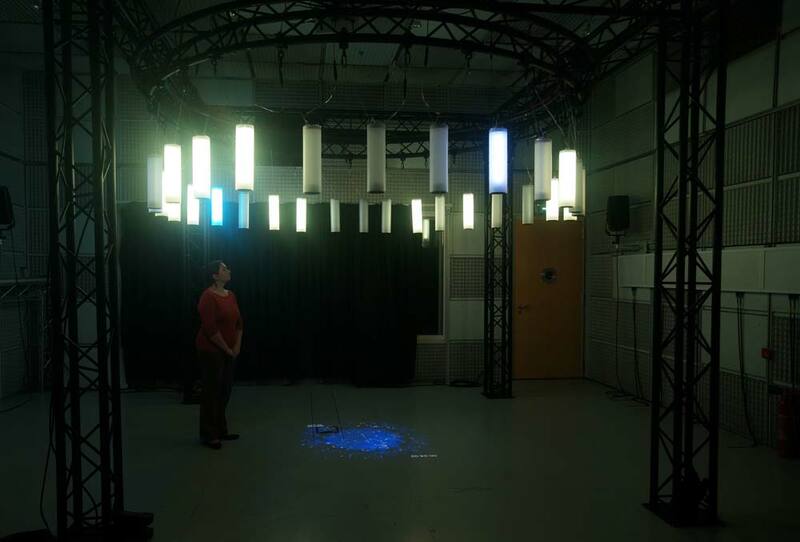 These detectors help to analyse the behaviour and are later important for the sonification. Stations of the Vertigo residency were Bio4Comp labs in Dresden, Chemnitz and Würzburg (Germany) as in Lund and Kalmar (Sweden). Kick off at the Bio4Comp workshop in September 2017 in the city center of Dresden (Germany). 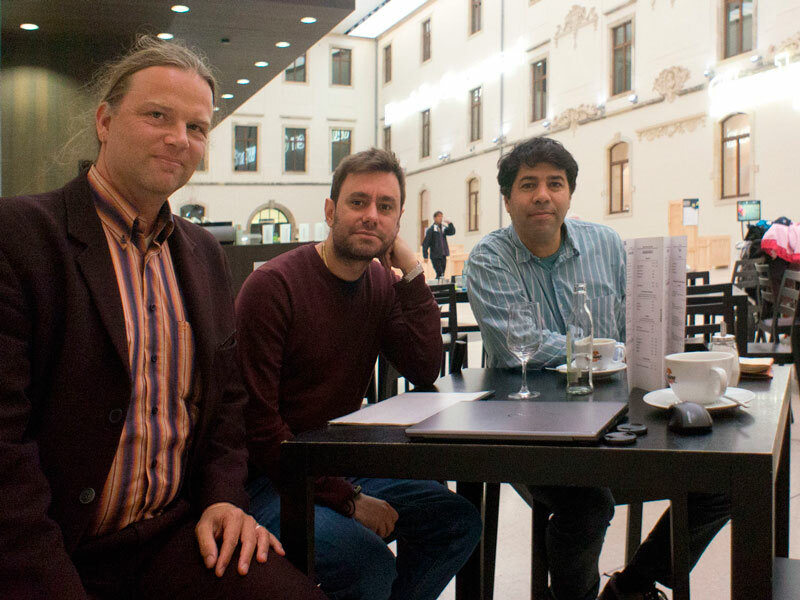 Conceptual questions were discussed with Dan Nicolau Jr. (Oxford) and Hillel Kugler (Bar-Ilan) in occasion of the Bio4Comp workshop in Dresden. Together with Till Korten, the co-coordinator from Bio4Comp, Tim Otto Roth designed at the Dietz lab in Dresden network structures for the SMART>SOS bio-computer. 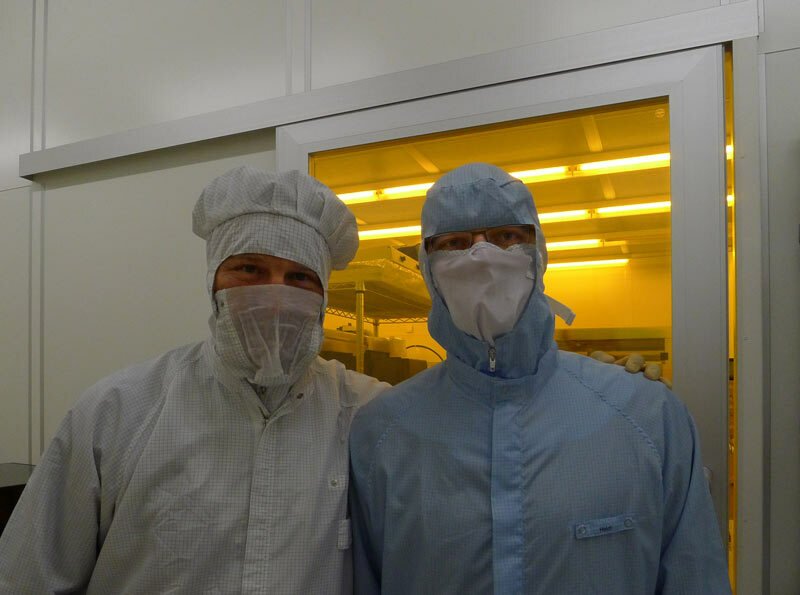 Togehter with Georg Heldt in the cleanroom at Fraunhofer ENAS in Chemnitz, where the nano structures for the nano-bio-circuit were built. The artist controling the structures with the optical microscope at the ENAS cleanroom. 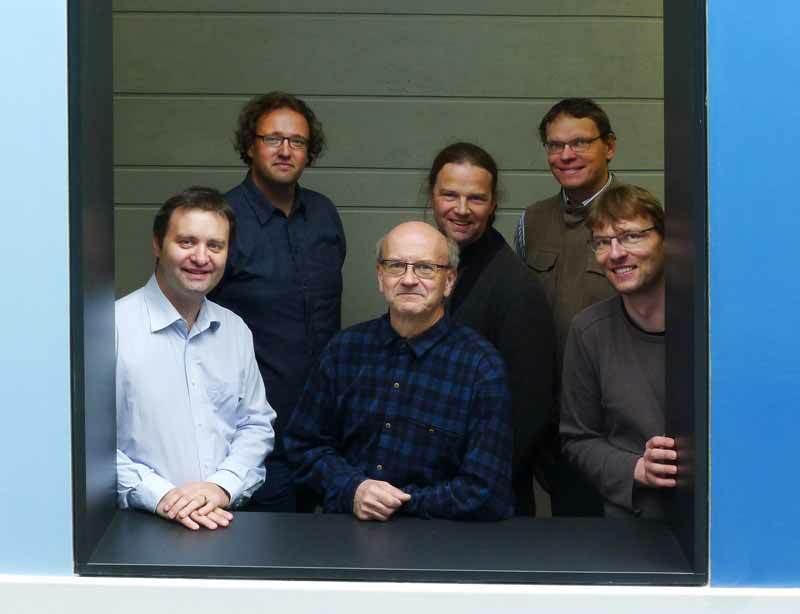 Members of the E-Beam Lithography group at Fraunhofer ENAS (from left): Danny Reuter, Christoph Meinecke, Jens-Wolfram Erben, Thomas Blaudeck, Georg Heldt. 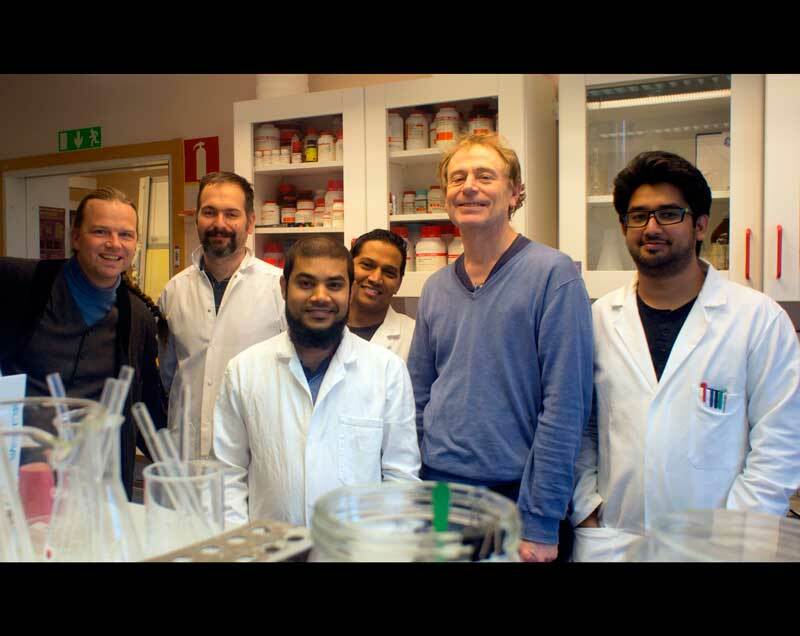 In the lab with Alf Månsson's Molecular motor and bionano-group at Linnaeus University in Kalmar. From the left: Aseem Salhotra, Alf Månsson, Venukumar Vemula, Mohammad Ashikur Rahman, Marko Usaj. 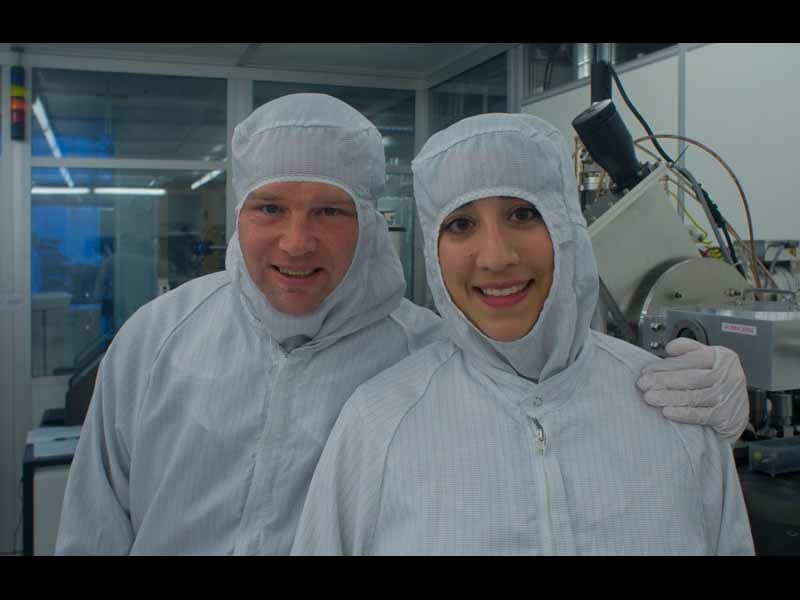 Together with Frida Lindberg working at Nano Lund: producing nano circuits. Visiting Sönke Steenhusen from the 3d-litography lab at Fraunhofer ISC in Würzburg. 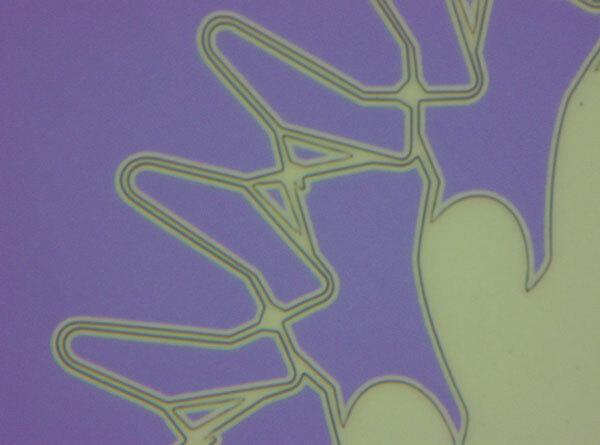 At the end of October the design was finally realized as nano structures in silicon by the E-Beam Lithography group lead by Danny Reuter at Fraunhofer ENAS in Chemnitz. 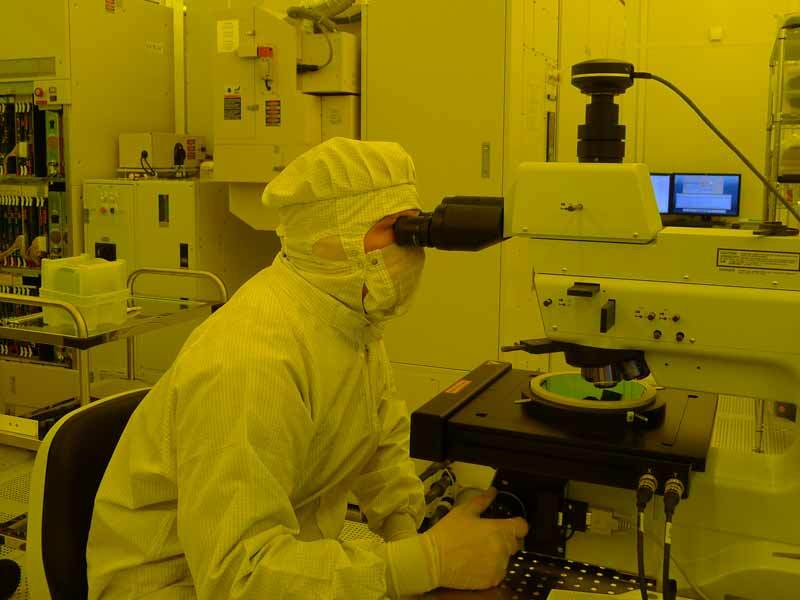 In the cleanroom the whole processing chain was executed by the artist thanks to the great introduction by Georg Heldt: Coating the silicon waver, exposing it to the electron beam and developing it after. Finally, wavers were dry edged resulting in nano-structures with channels of a maximum width of just 1 micrometre edged into silicon dioxide. Immediately after the structures were tested in Dresden. Till Korten developed a sophisticated procedure to treat the structures biochemically. 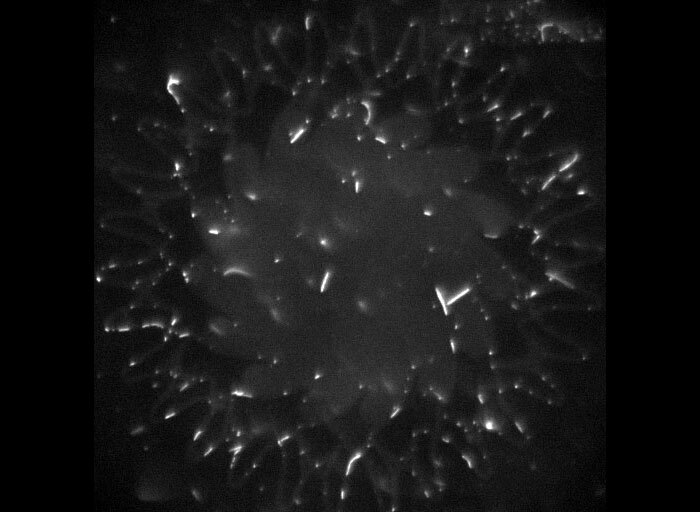 Finally, the first images in the fluorescence microscope revealed that the structures not only work, but the agents even revealed a less biased behaviour then predicted in the simulations. In total, 10 different nano structures scaled to three different sizes were examined. 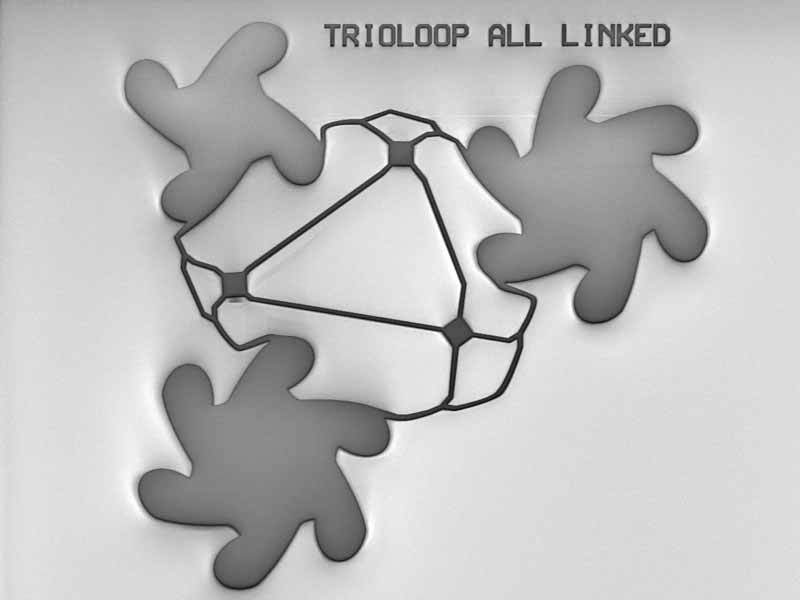 Beside the big ring like topology also a trio of three interacting substructures was created. The records of the microscope image series are the basis for further analysis. Finally, this footage will feed the video and sound installation. 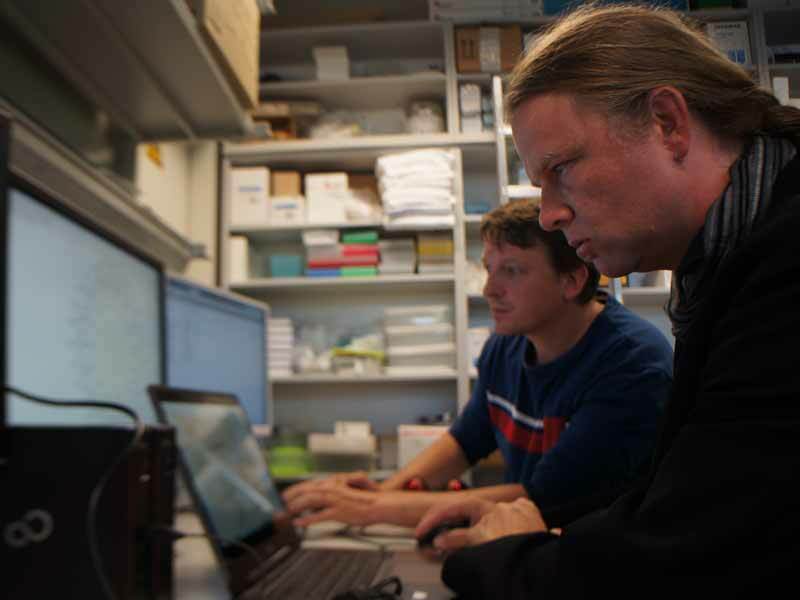 Further stations of the residency were lab stays in Sweden with Frida Lindberg at Nano Lund and with the team of Alf Månsson at Linnaeus University in Kalmar getting acquainted with actin filaments as another molecular agent. 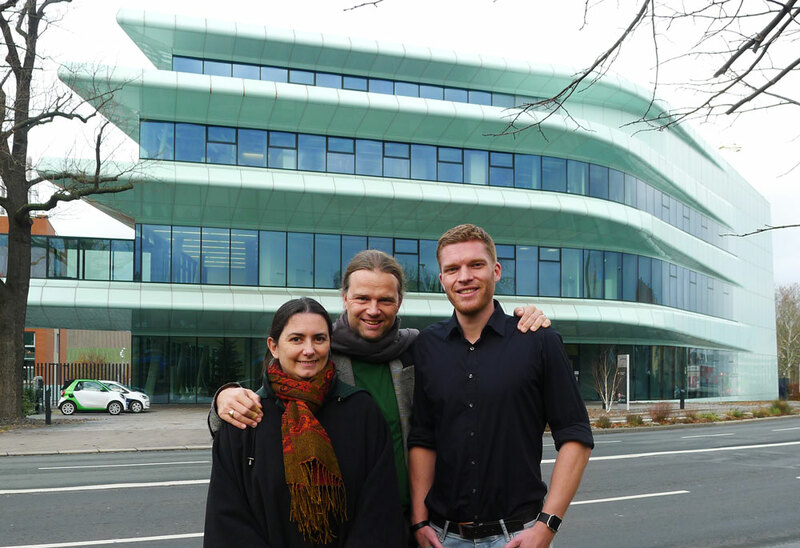 A visit in the 3d-litography lab at Fraunhofer ISC in Würzburg (Germany) complemented the residency. This article on the homepage of Linnaeus University covers the artist's stay in Kalmar. Microtubules do have a diameter of just 20-30 nanometres, which is much below of the wavelength of visible light ending at 390nm. This means that in a normal optical microscope the tubular molecules are simply invisible. 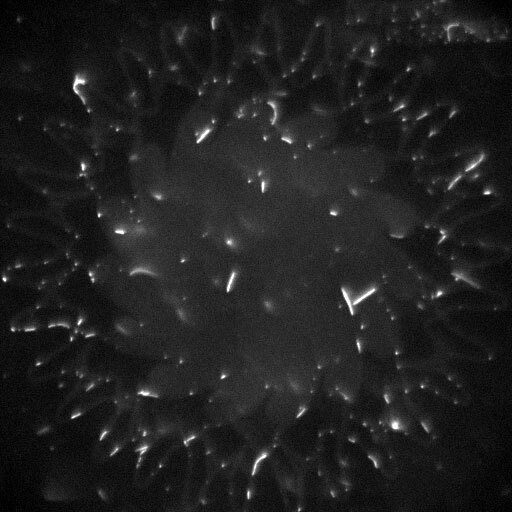 This is why the microtubules are tagged with a fluorescent marker, so they become visible excited with UV light and can be recorded with a high sensitive video detector recording in our case b/w images of 512 by 512 pixels. 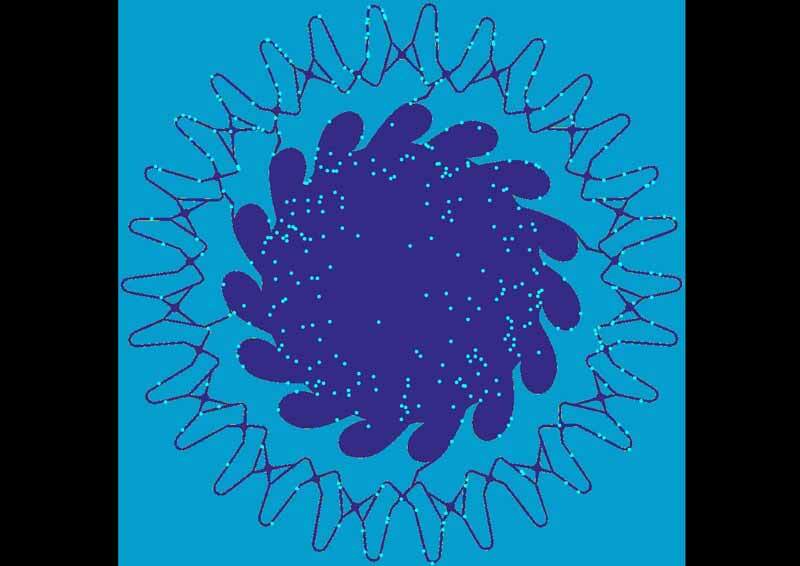 The simplest form to get a first impression of the behaviour of the molecular agents is to animate the sequence of images recorded every two seconds. SMART>SOS uses also such a time-lapse as central floor projection refined by its colouring. 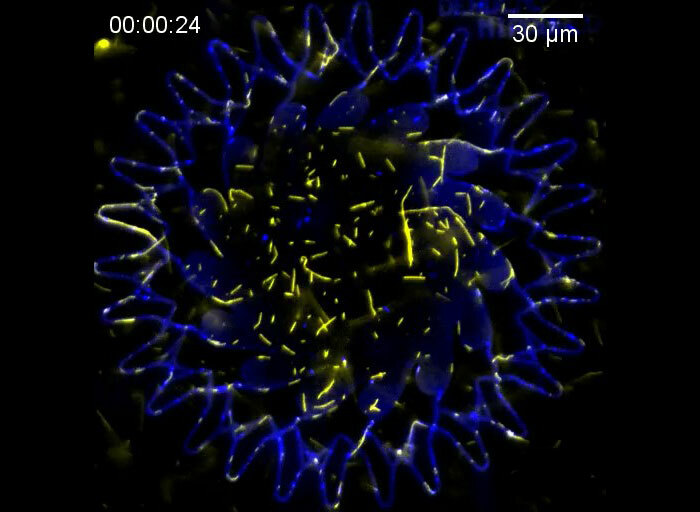 Here the colours yellow and blue highlight the dynamic and static part of the imagery. 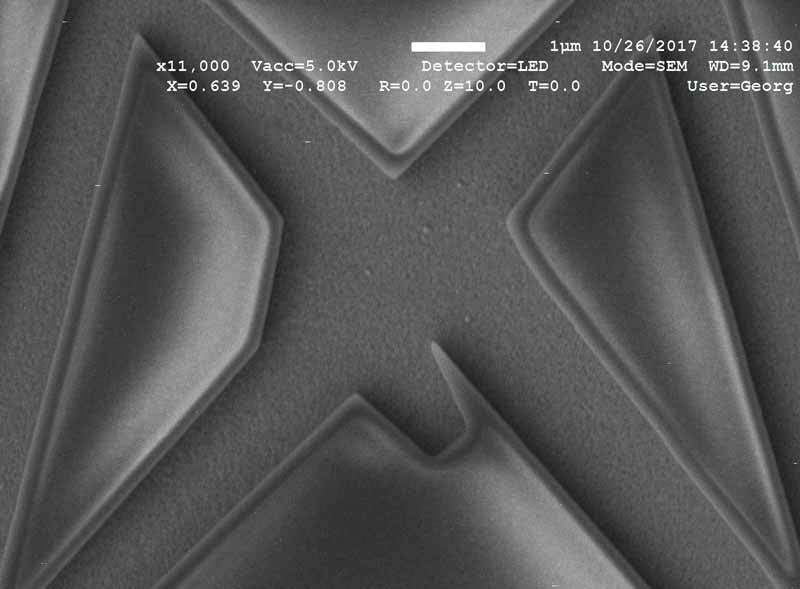 The scanning electron microscope picture reveals the nano structure designed for SMART>SOS. The edged channels do measure a width of less than 1000 nanometres. Image: Georg Heldt. Due to a weak fluorescence of the gold layer the edged valley structure becomes visible in the fluorescence mircoscope, too. 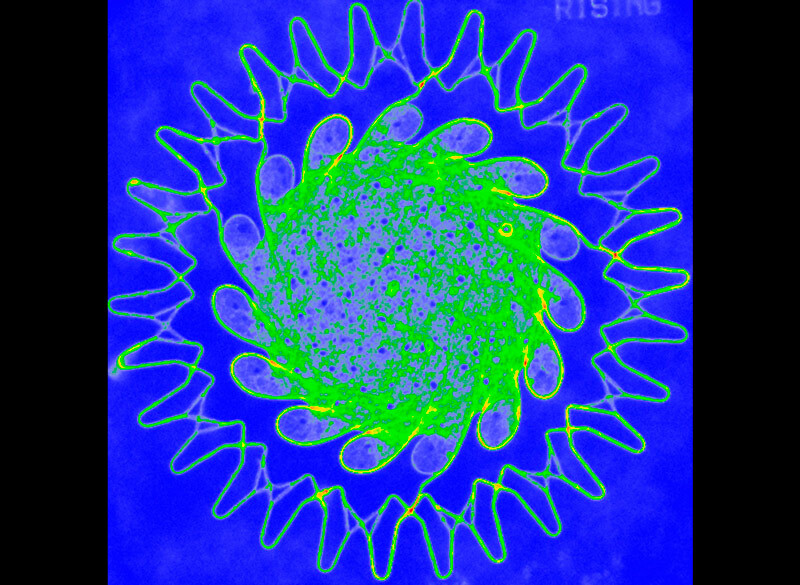 Colour processed image for the animation: Yellow highlights the dynamic parts and blue the static regions. A heat map gives a rudimentary impression of the system's behaviour. 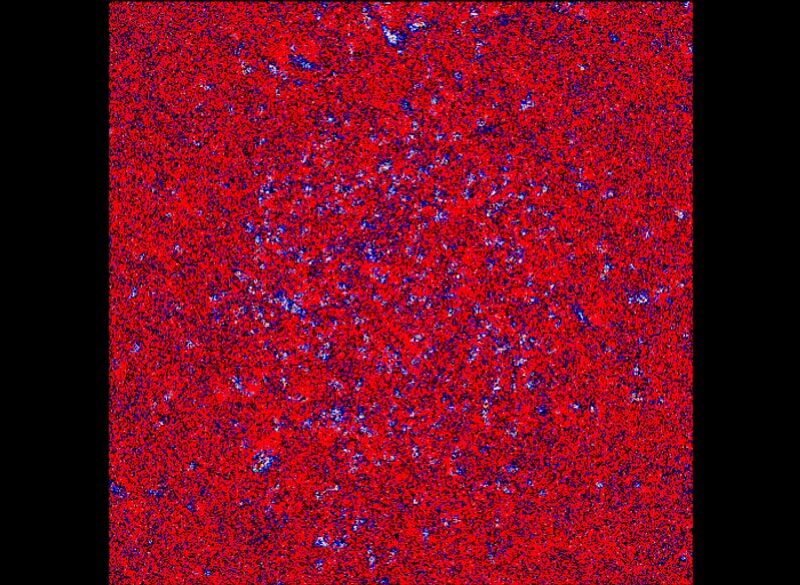 Subtracting two subsequent images helps to detect variations: The highest changes in intensity is visualized by the blue pixels. The flux is measured with the help of 30 "detector" zones. A heat map allows to get a rudimentary impression of the system's behaviour at one glance. It is a kind of long-time exposure integrating the whole image series to one picture using a special trick: Not the raw single images are integrated but the difference images of two subsequent frames. This image subtraction allows to record only the changes in the image sequences speaking the moving parts. This is why the difference images are of importance to measure the flux of the agents, as they filter out for instance agents, which are simply stuck in the channels. 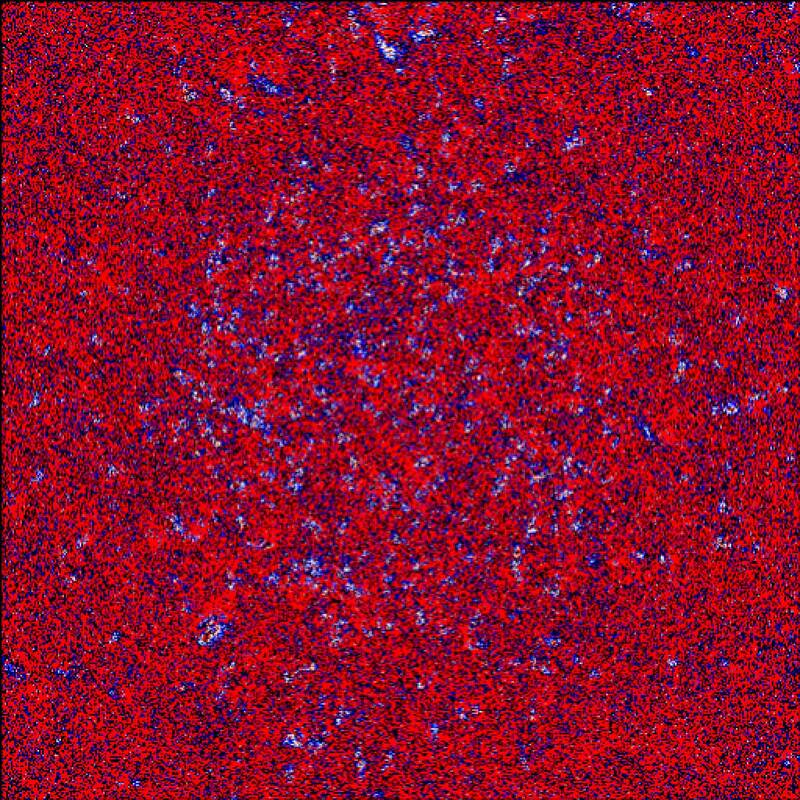 By a special processing with a red and blue colour map the animated series of difference images get a particular look viewed with anaglyphic glasses: The blue regions marking the agents seem to fly over a moving background. The difference images are also used for the quantitative analysis of the agent's flux. This analysis focusses 30 zones measuring the changing brightness of pixels at the two exits of the 15 "logic units".  The resulting series of numbers registering the pixels hits in the zones are the basis for a further mathematical analysis. In the context of the VERTIGO STARTS day the premiere of SMART>SOS took place at IRCAM from 13-15 June 2018. In the darkened space of the Studio 5 at IRCAM a ring of 30 illuminated loudspeakers is pending from the ceiling. They are playing variations of band-filtered noise, which can sound like a soft blow of wind or the terrifying sibilance of summer thunderstorm. The basis of the composition for the tube like translucent acrylic loudspeakers designed by the imachination studio are the motions of bio-molecules moving in an ornamental circular nano-structure, which Tim Otto Roth created during his Vertigo Starts Residency. 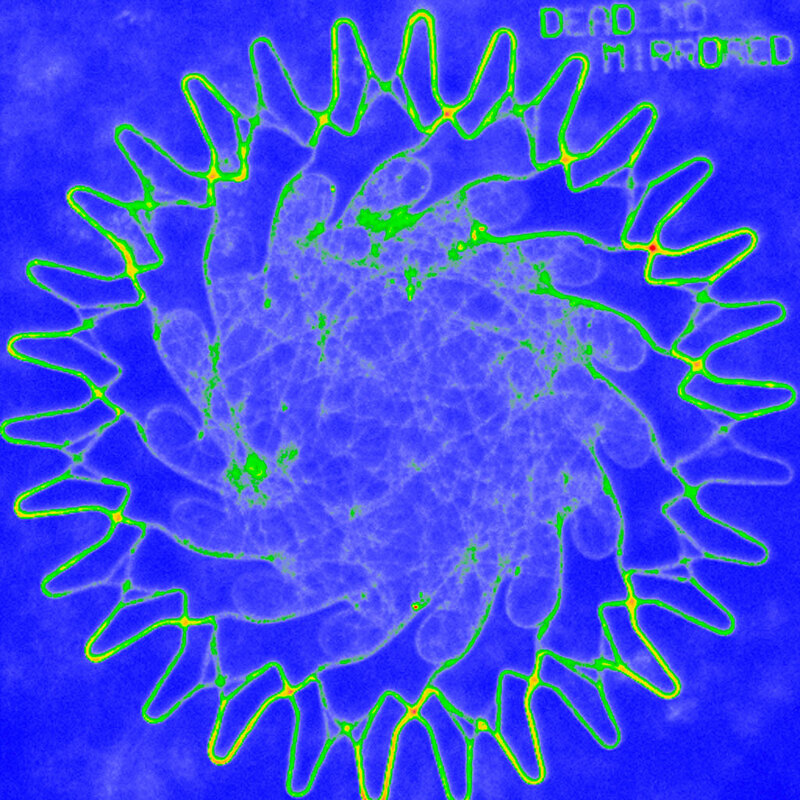 A floor projection in the middle of the speakers shows a series of fluorescence microscope images depicting the structure loaded with the worm like molecules in action traveling trough the silicon channels just 1000 nanometers wide. The presentation was open to the public from 13-15 June. Additionally Tim Otto Roth gave a personal introduction in a talk together with his scientific collaborator Till Korten from TU Dresden on 15 June at 12:15h at the Vertigo Residency Day taking place at the lecture hall in the Centre Pompidou. Please find a selection of former projects on our vimeo channel.